When this card is destroyed by battle and sent to the GY: You can Special Summon 1 Level 7 or lower “Red-Eyes” monster from your Deck, and if you do, equip this card from the GY to it. It gains 300 ATK. If this card is sent to the GY while equipped to a monster: You can add 1 Level 1 Dragon monster from your Deck or GY to your hand. Ratings are based on a 1 to 5 scale. 1 is Horrible. 3 is Average. 5 is the highest rating. I wish it had been Red-Eyes week last week and Dark Magician week this week! With news of Dark Magician the Dragon Knight, it made me long for the deck big time. Alas, it was not to be. Red-Eyes Baby Dragon is up today, the card that truly makes Red Eyes B. Chick (now known as Black Dragon’s Chick) a curiosity. The new Red-Eyes support harmonizes many of the old support cards that previous support failed to do. Ironically, the new support is self-sufficient, especially in the monster department. With the exception of a single Red-Eyes Darkness Metal and the two vital level 1 monsters in the theme, the new support makes up the best monster line-up for an optimal Red-Eyes deck. Red-Eyes Baby Dragon is a must run, and although it doesn’t really wow you at first, its appeal changes when you realize that his effects aren’t once per turn and that summoning shenanigans can lead to multiple searches per turn. And while his first effect isn’t optimal, it’s definitely not bad, especially considering Red-Eyes users set monsters more often than most players due to the summoning restrictions of Red-Eyes Fusion. Also, while you would normally want to steal an opponent’s monster with Red-Eyes Fang, you can equip Baby Dragon by its effect as well, thereby setting up potential plusses should the need arise. You only need to equip it once to get a good engine going. As with Dark Magician and Blue-Eyes White Dragon, Red-Eyes Black Dragon will receive periodic new support for the duration of the game’s history. It’s been to the top of the mountain before and it will get there again. Red-Eyes Baby Dragon’s effect isn’t once per turn, and that’s all the potential it needs to guarantee play for a long time. Solid card to start the Monday. Red-Eyes Baby Dragon is the newest edition to the Red-Eyes archetype. This cute little guy is a definite improvement from Black Dragon’s Chick. A good searcher, you’ll be getting any of your Level 7 or lower Red-Eyes monsters from the deck off of this guy being destroyed by battle. Ten total targets available for Red-Eyes Baby Dragon to tag in. Creature Swap and destroy RE Baby Dragon and get a Special Summon, classic play for searchers. When it hits the grave from a battle, Red-Eyes Baby equips itself for a small ATK boost, which is good, but the extra search you get when Baby hits the grave as an equip is the better effect. Black Stone of Legend is the first target you think of for this effect, but there are others depending on what combo of cards you are running in the deck. White Stones and Buster monsters are also options, but Black Stone is #1. If Red-Eyes Baby Dragon offered protection as an equip instead of the ATK boost, it would be one of the best monsters in the deck. Its search as an equip is great, and it is a great searcher. A great card for the archetype. 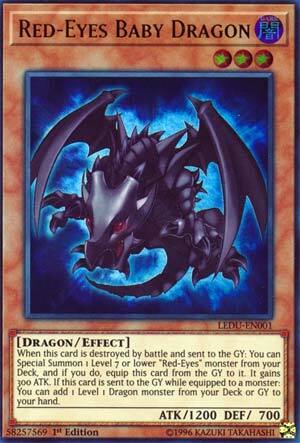 Red-Eyes Baby Dragon is a Level 3 Dark Dragon-type monster with 1200 Atk and 700 Def. This kid wants to help very badly, but it needs to be sent to the grave from battle before it can Special Summon any 1 Level 7 or lower Red-Eyes monster from the deck. Then it equips itself to that Special Summoned monster and gives it 300 Atk. Fortunately, this can happen during either player’s turn. Unfortunately, on its own, Red-Eyes Baby Dragon just doesn’t do enough for the new or the old deck. If it’s equipped to a monster by any effect and both are sent to the grave, you can search a Level 1 Dragon from the deck to the hand. There are better Red-Eyes search cards. This effect is certainly more useful and more likely to trigger. Honestly, this just needed to be a Level 1 tuner to be really good. How perfect is it that product has lined up to where we can do a Yugi Week and then a Joey Week. Konami is really trying to milk the nostalgia from the original series, I hope they do more with GX soon, they are starting to go in that route. Nonetheless, we are looking at some Red-Eyes cards since we got some good Red-Eyes support in Legendary Duelists, three cards are retrains, and we start with the first retrain, Red-Eyes Baby Dragon. Obviously a retrain of Baby Dragon, Red-Eyes Baby Dragon has the same stats, but an actual effect. When Red-Eyes Baby Dragon is destroyed by battle and sent to the GY, you can summon a Level 7 or lower Red-Eyes monster from the deck and equip this card to it, which allows that monster to gain 300 ATK while equipped to Baby Dragon. If Red-Eyes Baby Dragon is sent to the GY while equipped, you can add a Level 1 Dragon from your Deck or GY to the hand. I like the floater effect, almost every deck nowadays has a floater. The search is neat to get to The Black Stone of Legend or Black Metal Dragon much easier. Just know, I like all the new Red-Eyes cards in Legendary Duelists, they are very neat. This is the worst of the new support, but it is still very neat. After a Yugi themed week from new release cards, we have a Joey themed week for you, so I hope you enjoy this as well! Opening the week is Red-Eyes Baby Dragon. A Monster who works similarly to, yet different from, Red Eyes Black Chick. See, Chick can be sent from your Field face-up under your control, to Special Summon Red Eyes from your Hand. That’s as far as that goes, you get one, original, REBD from your Hand. Here, you can Special Summon one Level 7 or lower Red Eyes Monster from your Deck…BUT this card has to be destroyed by Battle, and sent to the Graveyard. Not that those things are impossible at all, but to be forced into both kinda is a downer. Destroyed in Battle OR sent to the Graveyard would have been better. Plus, you’re likely going to have to set this card, because either 1, your opponent will remove it if they see it in attack mode, to keep you from getting the effect, or 2, destroy it anyway just to destroy your new Monster, because they’re all ready in a position to do so, and it won’t matter if you do. Anyway, if you’re successful, you equip this card to whatever you Special Summon, giving it 300 extra attack (meh) and then if this card is sent to the Graveyard while equipped, you can add a Level 1 Dragon from your Deck or Graveyard to your Hand. There are a few options there, but being restricted to Level 1 isn’t so great either. I’m all for Red Eyes, nostalgia, and theme support, but this card just doesn’t quite cut it.